Representative of the Vidrodzhennia (Revival) Party Bohdan Andriyiv wins the mayoral election in Uzhgorod, local media reported. In particular, the Zakarpattia online website cites data allegedly obtained from all polling stations, according to which Andriyiv received 20,665 votes (58.57% of those who took part in the vote), while his rival, self-nominee Serhiy Ratushniak got 10,903 votes (30.9%). More than 10% of the ballots were spoiled. Other Zakarpattia media quote data on the parallel counting of votes from a significant number of polling stations, which also indicate Andriyiv's victory. Andriyiv announced his victory on his Facebook page referring to the parallel vote count. 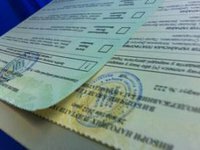 According to the data of the OPORA civil movement, the voter turnout in Uzhgorod was 38%.